The course fee is as prescribed and fixed by the DTE&T, Govt. of Orissa from time to time. 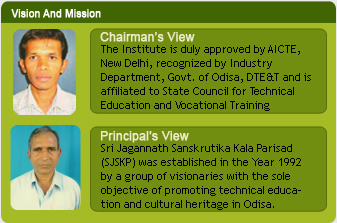 The Academic Calendar of the Institute is as prescribed by the State Council for Technical Education and Vocational Training (SCTE&VT), Orissa, Unit-VIII, Bhubaneswar-12. Semester pattern (Summer and Winter) Examination is conducted by the State Council for Technical Education and Vocational Training (SCTE&VT), Orissa, Unit-VIII, Bhubaneswar-12. The Institute awards scholarship of Rs. 5000/- to the students of all branches of Engineering for his/her remarkable performance in the Examination conducted by the State Council for Technical Education and Vocational Training (SCTE&VT), Orissa, Unit-VIII, Bhubaneswar-12. The Institute has also a welfare section headed by a Senior Faculty to look after the post matric scholarship of the SC/ST students.